Since the game-changing spike that took place on Thursday, March 12 2018, traders have been squeezing the opportunity to step-in on the lows as values this declined tomorrow could be just history when more bulls get their saying. 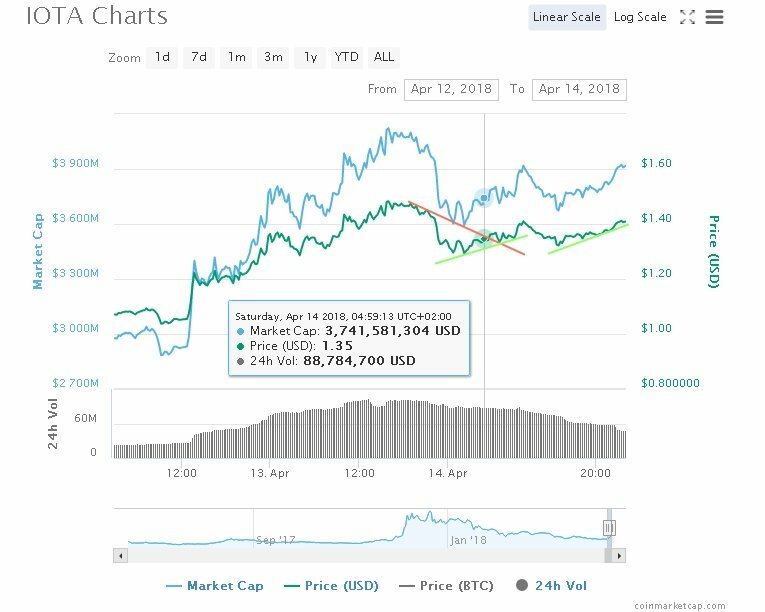 One of the coins which is doing very well is IOTA with 41.60% gain in the last 7 days. Per time of writing, as long as the pair MIOTA/USD stays above the daily declining trend line and the $1.35 mark, there will be opened gates for a continuation of the bull run. Recent IOTA news has seen Fujitsu executive Rolf Werner join the IOTA foundation, which contributed to positive investor sentiment, but the most interesting announcement to come from the IOTA development team recently is the announcement of the upcoming Trinity desktop wallet launch. Werner before joining IOTA foundation was part of Fujitsu’s business development in Switzerland, Germany, and Austria. He is today the in the chairman, Fujitsu Technology Solutions GmBH Board where he’s depended solely on. He is seen as the go-to business developer. Joining IOTA means a substantial development for the blockchain company owing to his wealth of knowledge and experience in business development. A March update outlined the current developmental state of IOTA’s highly anticipated Trinity wallet app, which is now in a security audit stage. IOTA developer Navin Ramachandran stated in the update that, while the app project has been hindered by a lack of standardization within coding guidelines exacerbated by a failure to communicate accurate timelines with the IOTA community, the Trinity wallet app is already in an alpha stage of testing. The planning, development and work put on the user-friendly wallet app Trinity has been going on for many months now and it is set to come to a conclusion in about 6-7 weeks. The progression of the Trinity desktop version will be sped up as the IOTA team has taken a very cross-platform approach in the full development of the app. The release of both a desktop and mobile IOTA-specific wallet app is set to significantly improve investor sentiment toward the slow-moving IOTA project. Trinity does deliver multiple sees and a ‘statefulness’ feature that writes down all transactions and balances with the target to fly past the issues presented by IOTA’s snapshot function – additionally to all the standard wallet features.